Kutsinta is one famous kakanin in the Philippines. A favorite of Filipinos for breakfast or merienda, the kutsinta or cuchinta is a brown or orange rice cake. It can be served as homemade or there were those who sell them in the streets or local markets. It is often served with grated coconut meat. 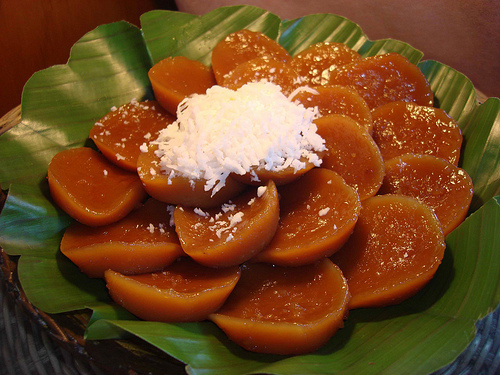 Filipinos enjoy it as a quick filling snack or along with other sweets. 1. In a large and deep casserole or kettle or container, mix all the dry ingredients – plain flour, tapioca flour and brown sugar. Add in water and mix thoroughly until dry ingredients have basically dissolved into the water and a thick homogenous mixture is attained. 2. Using a fine colander let the mixture pass the fine sieve. Strain properly to ensure a smooth mixture. You can press the soft lump to allow passing it into the fine colander. Continue doing this for the rest of the mixture until a smoother mixture is collected. 3. Add in lye water into the mixture and stir properly until it becomes yellowish in color. Add in orange food color and continue stirring until it is evenly blended. 4. The next step is to prepare the molds or small containers. Fill the cups with the mixture to about ¾ full. Arrange them properly in batches in the upper layers of the steamer. 5. Heat the water in the steamer until it is briskly boiling. Mount the upper layers and steam for about 15 to 20 minutes, until the “kutsinta” have cooked through. 6. Take the “kutsinta” from the steamer and allow cooling. Meanwhile continue with the succeeding batches. Continue cooking until all the mixture is consumed. 7.Remove the cooked “kutsinta” from the molds and arrange them in serving plates. Top them with grated coconut and serve.